One piece of fitness equipment that is common to most gyms is the rowing machine. Otherwise known as an ergometer (or erg), the rowing machine might not be the first choice for many fitness enthusiasts over the treadmill, but it packs a surprising workout punch. This low-impact exercise tool provides a full body workout that will get your heart pumping fast and improve cardiovascular fitness in-addition to helping tone your upper and lower body. A step-up from the JLL R200, the Bodymax Infiniti R90 rowing machine is a bit pricey but, in our opinion, worth every penny. It not only features a rowing action that is just as smooth and quiet as the R200 but also has an equally comfortable (and foldable) design. To top it off, the Infiniti R90 features a more advanced LCD console, more resistance levels, and even features a higher quality build. Simply put, the R90 is packed with premium features that make it a worthwhile investment as well as a good fit for pretty much anyone. Read this user guide to determine whether the R90 rower from Bodymax would be a great addition to your home gym setup. As a part of the Super Rower edition that was designed to be the perfect in-home rower, the R90 was built with every potential user in mind. Made from durable aluminum, the unit provides excellent stability to support both light and heavier users. To ensure there is something for everyone, the R90 includes a whopping 12 workout programs plus 16 different resistance levels that start easy and become quite challenging the higher up you go. However, all programs have the advantage of being quite enjoyable as the rower has its footrests placed very close together to provide an exceptionally smooth rowing action that emulates the feel of rowing on water. Comfort is also included on this unit via a contoured seat, cushioned handlebar, adjustable strap-on pivoting pedals, and a rail that is long enough to allow for comfortable full strokes even for people over 6ft tall. When it comes to rowing machines, resistance is usually increased by either rowing faster/harder or through a lever feature. The R90 adds a unique touch by including a resistance button on the machine’s handlebar. This feature is perfect when you are doing HIIT exercises. Simply press the button to move from light to heavy resistance without ever having to stop rowing. Another cool characteristic about the Infiniti R90 is that it takes away the guesswork from rowing. While you can still follow a systematic approach of moving from one rowing level to the next like with most rowers, the R90 also includes pre-set workout programs that are labeled according to what they achieve – Watt Calorific Burn, Race, Recovery, Heart Rate Controlled etc. This makes it easy for you to get right down to rowing towards your intended fitness goal. The convenience on this rower also extends beyond your workout. The R90 features an intuitive modular structure that enables you to fold the machine in half without breaking a sweat(!). And, thanks to wheels at the front, you can easily roll it back and forth from your workout to storage areas. The integrated monitor on this Bodymax rowing machine is one of the best and a close rival to the one found on the Concept2 Model D rower. First off, the monitor looks great and boasts a two colour back-light illumination. The monitor also allows you to create a user profile (featuring your weight, height, age, etc) not just for you; but also for anyone else using the machine. Once your profile is set up, you can use one of the 12-preset workouts or have some fun with the races and challenges features. Feedback readings shown on the monitor include time elapsed, speed, distance, calories, torque, stroke, and strokes per minute. You can also get a reading of your heart rate by using a telemetric chest belt. 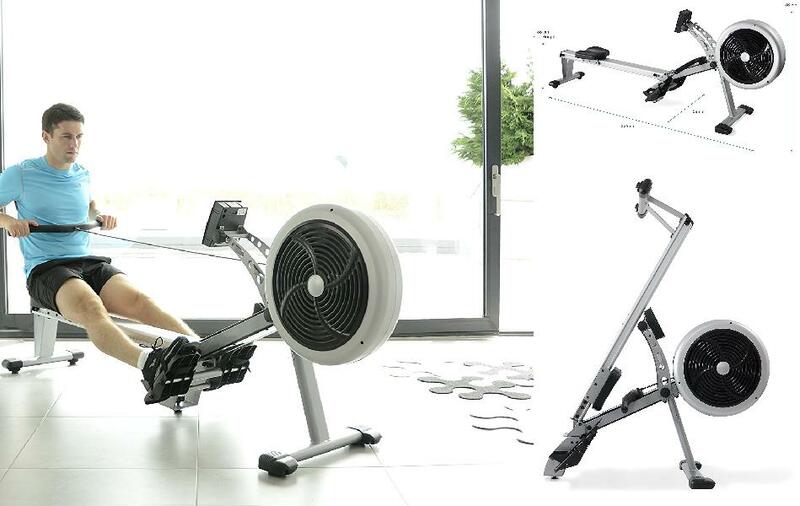 The Bodymax Infinite R90 can be summed up in 3 simple words: ‘well-engineered rower’. The machine’s frame is very solid and strong, the design is thoughtfully crafted to suit everyone, the resistance levels are plenty, and the advanced console is simply amazing. The best part is that the R90 is cheaper than the Concept2 Model D despite featuring more or less the same features. 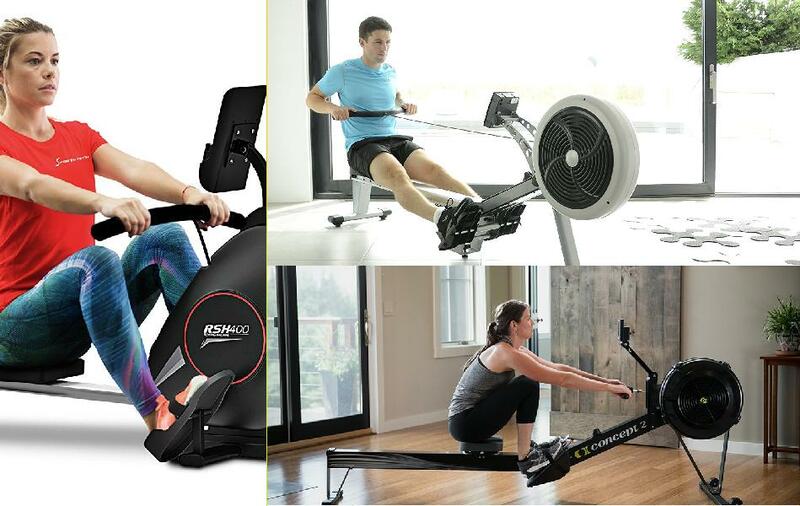 The Body Sculpture BR1000 is designed for beginner (and possibly intermediate) rowers and targets those who want to get fit through rowing without spending the hundreds of euros that mid and high-level rowing machines cost. However, with a price tag of under £100, it is natural to be skeptical about the machine’s capabilities. So, is the BR1000 any good at its job? Read this quick user guide to find out. When it comes to rowing the BR1000 does not have much in its arsenal. For one, it is a hydraulic rowing machine and therefore offers the least smooth rowing action compared to other types: water, air, & magnetic rowers. The machine’s simple design of a single Dial-A-Tension hydraulic cylinder piston does not do much to help with the situation. However, that is not to say that the rowing action of this rower is all bad. The machine features a 6-wheel carriage under the seat that helps ensure smooth gliding action while moving back and forth. For a new rower, this BR1000 rowing machine is recommendable because it offers 12 different resistance levels which you can slowly work your way up to a healthier and fitter you. And, just like all hydraulic rowing machines, adjusting resistance is made easy. You get a tension dial on the machine’s hydraulic cylinder plus an adjustable incline for changing up the intensity of your workouts. This is one area where the BR1000 rowing machine can stand tall when compared to other rowers including higher priced models. Aside from the 6-wheel carriage that makes for a smooth and easy movement over the rail, the BR1000 has a few more comfort features up its sleeve. 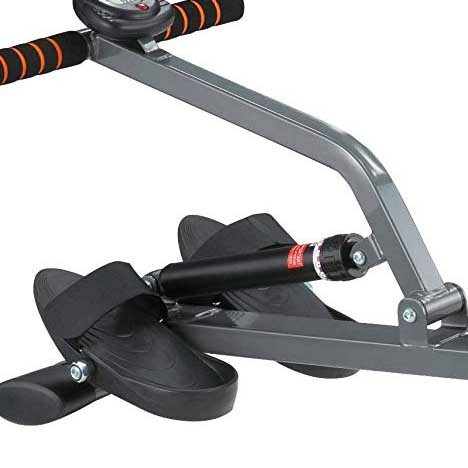 These include a padded seat that is made of leather, foam handles, and large pivoting footplates that are specially designed to protect the ankles from trauma regardless of how long you row. Straps are also provided for a comfortable fit. 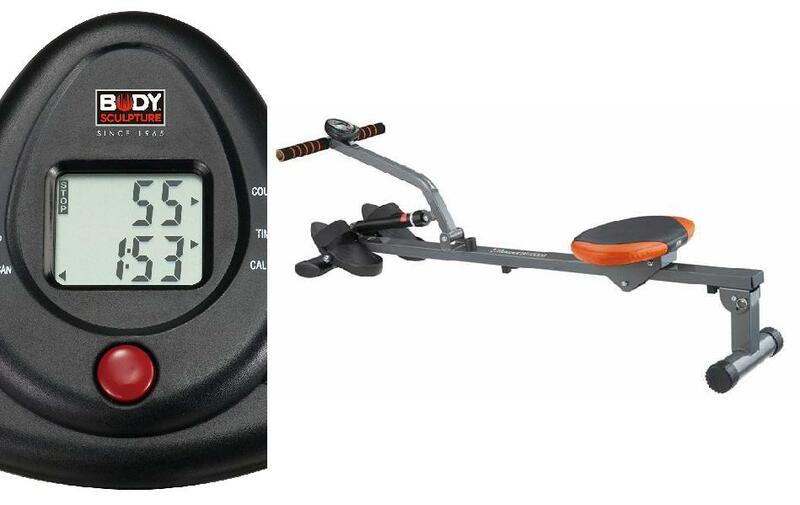 For goal tracking, the Body Sculpture BR1000 rower offers a simple digital display. The console shows Time spent rowing, calories used, strokes per minute, total count, and scan. For the price, this is a good feature and actually one of the machine’s best highlights. With the Body Sculpture BR1000 rower, you get what you pay for. 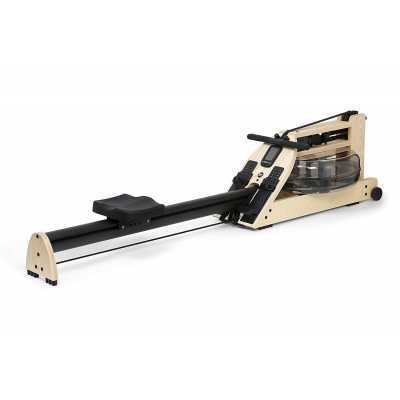 It is an inexpensive rower that does a very basic job. Therefore, if you are on a budget, need a rowing machine for rehabilitative purposes, or just want to engage in some light cardio and toning exercises, the BR1000 rower will do. But, if you want something more, there are much better rowing machines out there that offer a whole lot more starting with the JLL R200, which delivers a much better kick in terms of resistance at just a slightly higher price tag. If you want to enjoy the benefits of rowing for fitness but do not mind spending a bit of money to do so, the Concept2 Model D with PM5 monitor is a fantastic rowing machine that is worth considering. Everyone from professional rowers to avid fitness buffs have nothing but nice things to say about this rowing machine. 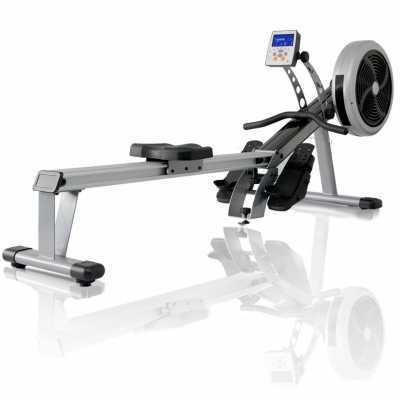 This indoor rower is also very popular in gyms and health clubs. And for a majority of rowing training facilities, the Concept2 Model D rower is usually the first choice. So it stands to reason that it is one of the best indoor rowers you can buy for the home. But, what is so great about the machine? 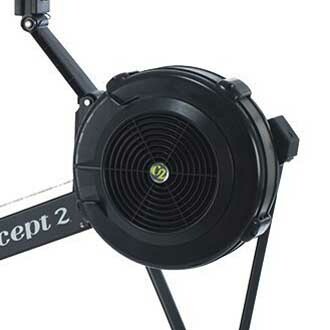 Read this buyers guide to find out why the Concept2 Model D is a popular pick. 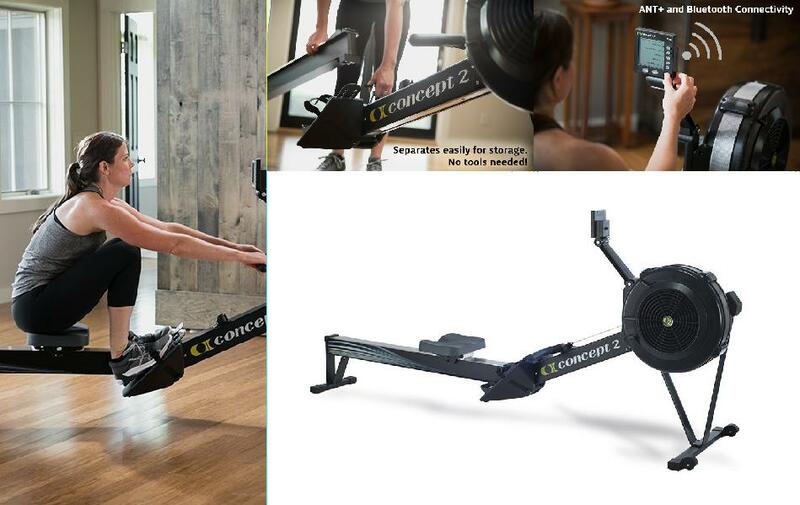 One thing to love about this Concept2 rower is that it delivers an incredibly smooth rowing motion. Because it is an air rower, the machine operates by spinning a fan flywheel when you pull on the handle. The flywheel then displaces air, which produces a smooth feeling resistance. This combined with the Model D’s pull-cable, which is nickel-plated for a smooth action, makes for one of the best experiences as far as rowing motions are concerned. The cable rolls out effortlessly and evenly without so much as a single jolt, jerk, or jarring movement throughout every rowing stroke. Another great thing about this machine’s resistance is that it can be adjusted both automatically and manually. Like with all air rowers, the faster or harder you row, the more the resistance increases. However, you can also increase resistance through a damper lever that has an array of settings ranging from level 1 to 10. Therefore, whether you are new to rowing or a die-hard fan of the workout, this rower will fit the bill. For the investment made on the Concept2 Model D, it is only fair that the machine should last for many years. The Concept 2 fits this bill thanks to a rugged build, which is designed to survive a gym environment where there will be one person after another exercising on the machine. The rower’s frame is made from a combination of steel, legs & rail aluminum, and chain nickel-plated – all materials that are very durable. But, that is the only tough thing about the machine. Being designed to adjust to you, the Concept2 Model D keeps you very comfortable during use. The seat is not only spacious but also features padding that keeps you comfortable even during long sessions. To top it off, this Concept2 rower features strap-in footrests that can be adjusted to fit your shoe size and an ergonomic handle with a 10-degree bend that helps keep your hands and arms at natural positions throughout rowing motions. A PM5 (Performance Monitor 5) monitor which sits well within the user’s line of vision is another outstanding feature of the Concept2 Model D. More of a mini-computer than a monitor, the PM5 display is the epitome of perfection when it comes to fixtures that track performance on rowing machines. The monitor displays the distance, speed, pace, calories burnt, and watt for each workout. Best of all, you get to choose between 5 display options – data-form, bar chart, force curve, large print, and with a pace boat/pacer. The latter option makes for a great incentive to train harder as it shows a graph display of your boat racing against a pre-programmed one. You can also race against yourself by programming one of your previous workouts into the monitor. The ability to see workout data on your Concept2 Model D with PM5 monitor is just the beginning. There are in-built games (Fish, Darts, Biathlon, & Target Training) on offer to keep workouts fun as well as plenty of connectivity options available. 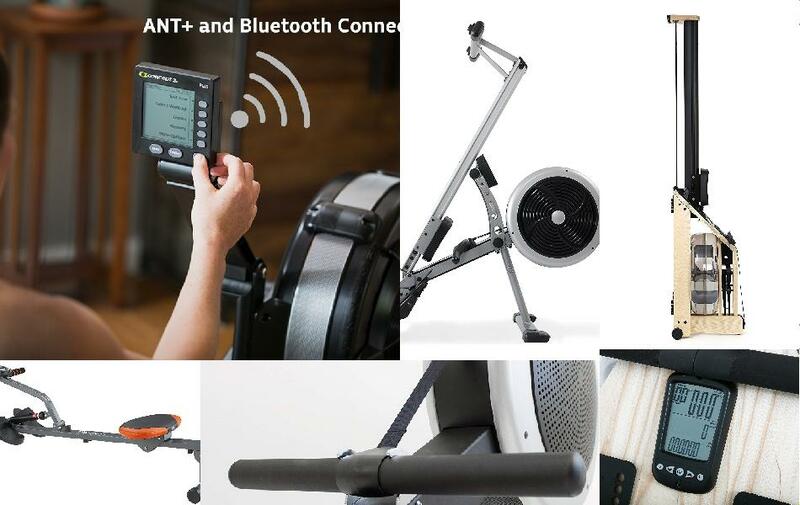 You get ANT+ and Bluetooth Smart support for wireless heart rate monitoring and a PC connection that gives you access to an array of third-party programs including Wired Racing with a PC, RowPro, and Concept2’very own Venue Race Application. Also included is a USB drive that lets you record, save, and keep a history of your workout data. You can also use the USB drive to transfer your workout data from your Concept2 rower to another. Easy 30 minutes assembly – For the most part, you will just be turning screws to attach the rower’s front legs. The Model D has a long footprint that demands plenty of space (9ft by 4ft) when you are rowing. Luckily, this is only a temporary problem as the machine separates into 2 pieces for upright storage that takes up little space. 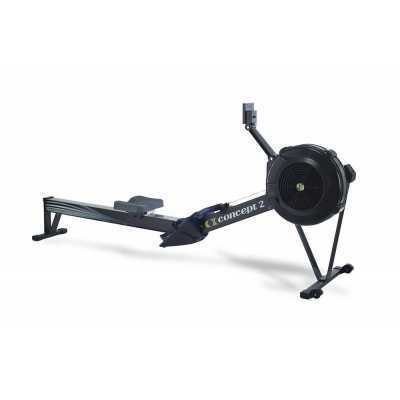 The Concept2 Model D with PM5 monitor is an indoor rower that falls in the higher price range (£800 +) but that is not something to complain about considering you get everything you need in a rowing machine. This machine is reliable, flexible, virtually indestructible, and delivers an intense workout despite its smooth rowing action. Overall, the Concept2 Model D is a rower, we believe, you won’t regret buying. 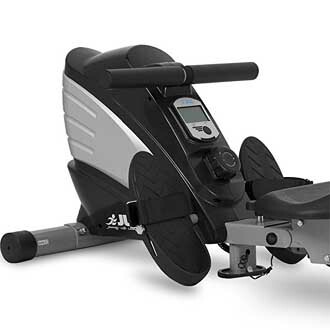 If you are shopping for a rowing machine on a budget, the JLL R200 is one of the top models you should look into, and with good reason. Although basic in nature, the rower comes with just enough features to keep workout sessions light and powerful. Here is a quick look at the available features as well as the pros and cons of this workout machine. Being a magnetic rower, the JLL R200 delivers the coveted smooth and quiet rowing action found in all machines of its kind. The R200 goes on to include a belt driving system in its build that allows for an even smoother rowing action. As a result, you can watch TV or even have a conversation (if you are not out of breath!) whilst rowing. 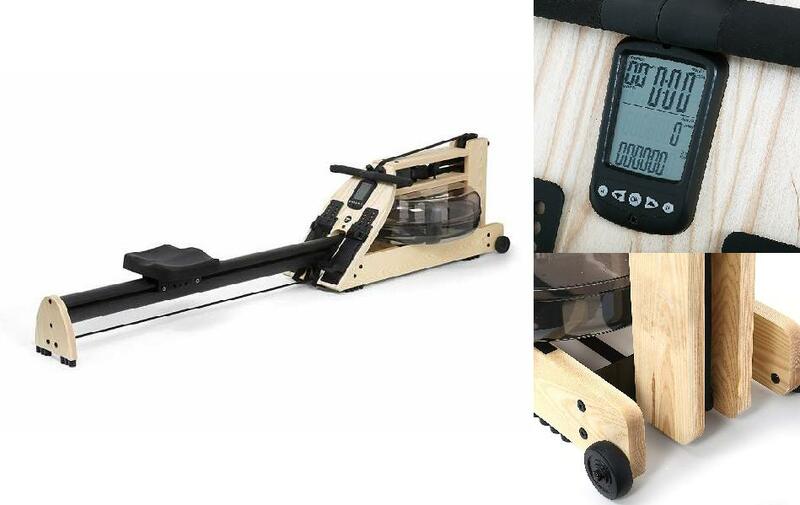 If you are new to rowing, the R200 rower has you covered. It offers 10 different levels of resistance, so the machine grows with you as your fitness level improves. Intermediate rowers can also get a kick from the machine as the higher resistance levels put enough energy demand on the body to trigger cardio and strength enhancing benefits. Despite being a budget level rower, the JLL R200 goes all out to keep users completely comfortable during use. The seat is specially contoured and features a soft, foam-filled padding to provide extra cushioning for longer rowing sessions, while the handlebar is foam padded for a better grip and ergonomically designed to ensure you do not strain your arms. The footplates, in turn, are wide, adjustable, and have straps that keep your feet securely in place. 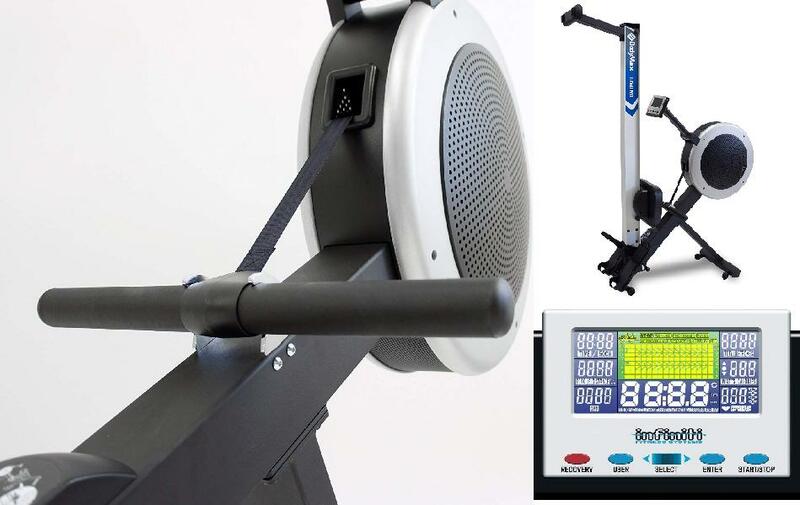 Compared to what other higher priced rowing machines like the Concept2 Model D or the Bodymax Infiniti R90 are offering, the LCD monitor on this unit is quite average. However, this is to be expected considering its lower price point.The monitor is monochrome and also not backlit like most options in the market. The operation is very simple and only includes a single button that you press quickly to move through the rower’s menu or hold down to re-set current settings. That said, you still get a wealth of information in the form of calories burnt, distance covered, time spent rowing, strokes per minute, and total stroke count per session. With its smooth and quiet rowing action, variable resistance, and very comfortable build, it is clear to see why the JLL R200 is dubbed an elite performance home rower. So, if your budget leans more to the £100 than the £1000 end of rower prices, this R200 machine is one of the best buys you could make. If you do not have £800 plus to spend on high-end rowers like the Concept2 Model D or Water Rower – Ash/Aluminum rowers, this JTX Freedom Air Rower is a great reasonably priced alternative. 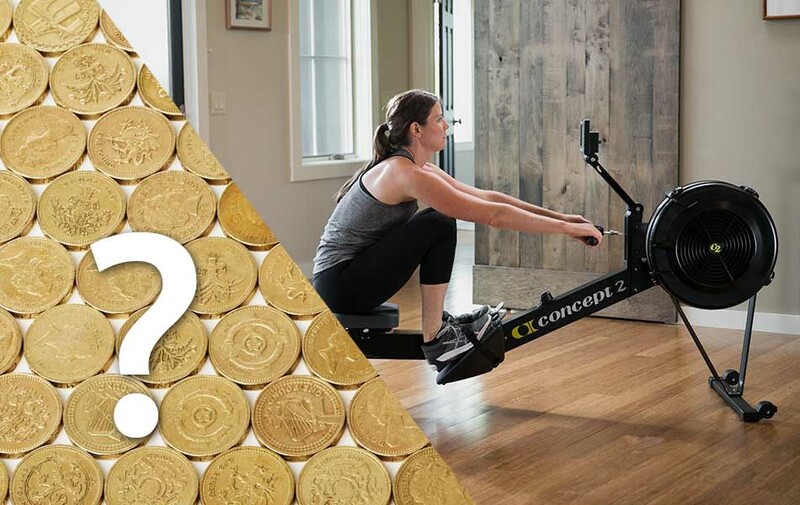 It may not be as smooth as the Ash/Aluminum Water Rower, boast of having the most advanced monitor like the Concept2 Model D, or even rival the build quality of these, but is a lot softer on your finances (around £200 less). That plus the fact that the JTX Air Rower is a stand-up machine in its own right makes it a good pick for anyone looking for a budget machine. 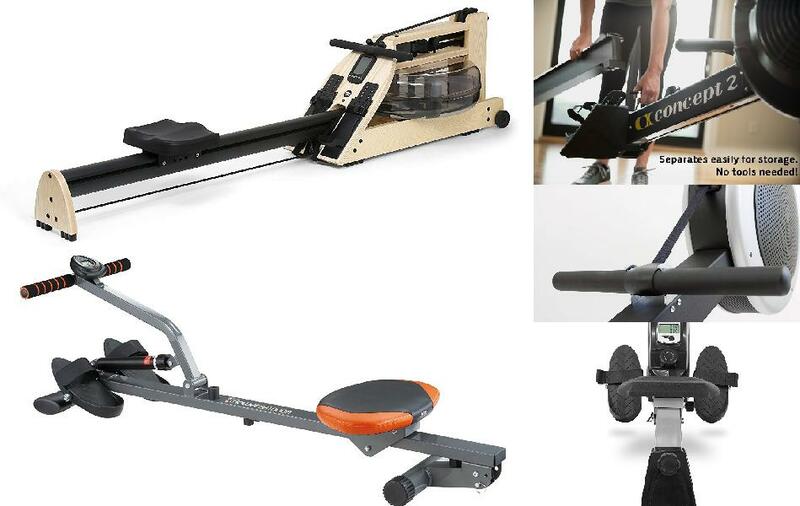 This guide sheds looks in-depth at the JTX Freedom Air Rower to give you an idea of what you can expect should you decide to buy it. This is one area where the JTX Freedom rower is at par with even the best high-end rowers. 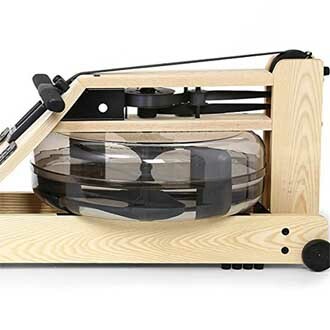 It is an air rower but also includes electromagnetic resistance to create a nice smooth action that feels a lot like pushing oars through actual water. The rowing action delivered is very similar to that of the Concept2 Model D.
A further benefit of the JTX DualTorque (air + magnetic) resistance system is that it allows for a great range of resistance levels – 16 in total. This is more than you can find on a good number of higher priced models. Thanks to this wide range of resistance options, the JTX stands as one of the most effective rowers around as even advanced rowers will be able to find a level that will cause them to break a sweat. Compared to another mid-level rower such as the Infiniti R90, this JTX Freedom Air Rower falls a little short when it comes to pre-set workouts. Instead of the 12 programs found on the R90, this JTX only has 8 pre-programmed workouts. You can, however, take comfort in knowing that these presets are 8 more than those found on the JLL R200 and even the higher priced Ash/Aluminum Water Rower. The 8 workout programs also include an array of great options like Hill, Interval, Endurance, Heart Rate, and Profile, which not only add a bit of fun to your rowing sessions but can also be used for specific targets such as improving cardio health or weight loss. Choosing a workout is as simple as pressing the ‘program’ button on this rower’s delightfully simple backlit display screen. The monitor also features ‘+’ and ‘-‘ buttons for adjusting resistance and ‘set’ & ‘reset’ buttons for customization purposes. A ‘display mode’ button, in turn, allows you to view a number of workout stats including speed/pace, distance, time, strokes per minute, revolutions, 500m split time, heart rate, and torque/power. Although most rowers allow for heart rate monitoring, you usually have to buy a belt or connect to an app to use this function. 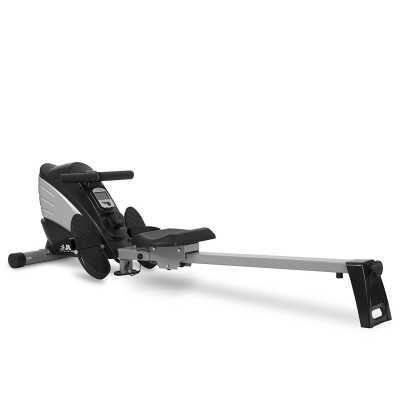 The JTX air rower, however, provides a chest strap along with the machine at no extra cost. The chest strap wirelessly syncs with the machine’s monitor to show your BPM (beats per minute). 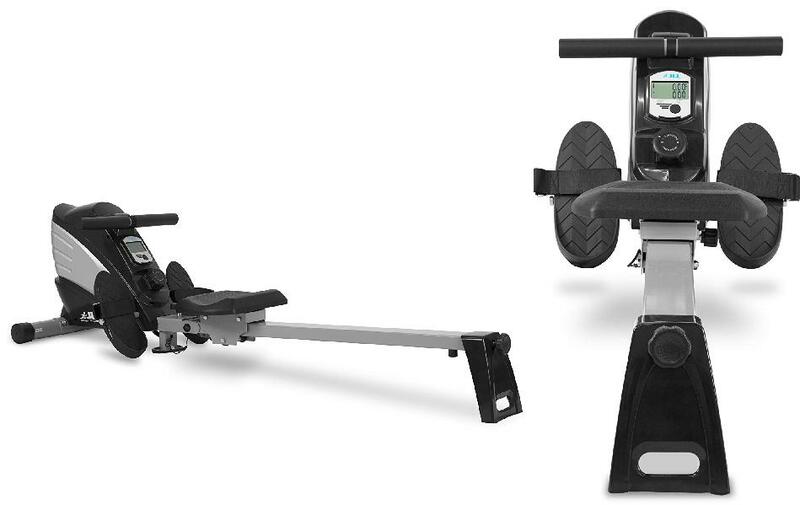 The JTX Freedom Air Rower may not be perfect but it has major pluses on its side. It is durable, replicates a rowing on water sensation which is as good as any non-water rower, and easily qualifies as one of the best when it comes to resistance options. All of this makes the JTX rower a good pick if you want a little more than what entry-level rowers have to offer but do not have the budget for a high-end model. Although the WaterRower – Ash / Aluminium (A1) does not have all the bells and whistles you would expect in a high-end rower, it got all the important aspects of rowing machines right. The build quality and rowing action are second to none and variable resistance makes this workout tool a good fit for people of all fitness levels. Read the complete guide to find out how the A1 rower compares against other rowing machines in the market. Advertised as being designed for life, the A1 boasts a sturdy frame that should give you years of service. The monorail of the machine is made of aluminium while other parts comprise of a combination of solid Ash and stained Honey Oak. Both of these timbers are excellent hardwoods. The go-to wood for home furniture, Oak is known for being heavy, strong, and long-lasting. Ashwood on the other hand (which is widely known for its use in baseball bats), is surprisingly stronger than oak. So, you can be sure that the A1 will literally last a lifetime if cared for. When it comes to storage, the A1 water rower is very different from the rest of the rowers in its class, but in a good way. The machine does not separate into 2 easy-to-store pieces like the Concept2 Model D, or fold into half like the Infiniti R90. Instead, the A1 is designed to stand on its front end – a benefit that cuts the rower’s footprint from 211(L) x 58(W) cm to just 50(L) x58(W) cm. So, you still get to enjoy space saving storage but without the hassle of having to fold your rower every time you want to store it. The best part is that with no multiple moving parts, you don’t have to worry about screws, nuts or bolts loosening up gradually over time due to repeatedly folding the frame when putting it away for storage. Features a simple Quick Start LED monitor that displays workout intensity, stroke rate, stroke count, rowing duration, and distance. Unless your heart is set on high-tech rowing machines, the simple design of the A1 is not necessarily a deal breaker. If anything, it can be said to be the machine’s biggest strength. Although it may not feature a high-tech monitor with pre-set workout programs or a resistance adjusting lever/ button, you get an Olympic quality rower with unrivaled durability in return. It is also the simple design of the A1 rowing machine that gives it the attractive price point of being one of the most low priced quality water rowers around. Therefore, if you have always fancied a water rower but have not dared to shop for one because of the high price tag associated with these workout machines, the A1 rower could just be what you’re looking for. In a world where heart disease is one of the leading causes of mortality, you could sure use a rowing machine in your life. This machine’s biggest benefit is that it really gets your heart pumping. Since every stroke/rowing motion requires the use of more than one muscle, your heart rate goes up and oxygen intake increases making for a very effective cardio workout. It goes without saying that the more you exercise a muscle, the stronger it becomes. Well, the rowing machine works most of the major muscle groups of your body. This includes almost all the muscles in your upper and lower body. So, the heart is not the only muscle that benefits from ergometer exercises. The rowing action will even strengthen your wrists and hands too! For someone looking to lose weight, the rowing machine can become your best friend. It is superior to most when it comes to burning of calories. Exactly how much calories you burn will depend on a variety of factors like age, weight, gender, fitness level, and the type of resistance on the machine. However, you can expect the number to be around 600 to a whopping 900 calories in one hour of rowing – more than you burn on a stationary bike or treadmill. The best part is that calorie burning does not stop there. Since the machine ups your oxygen intake, an effect (better known as EPOC – excess post-exercise oxygen consumption) is created which allows the body to continue burning fat even after you have gotten off the rowing machine. Whether low-impact cardio is what the doctor ordered, or you have other goals in mind, the rowing machine is a great choice. Most rowing machines come with adjustable resistance levels that give you the freedom to keep your workout as light or tough as you want to. You can also engage in HIIT (High-Intensity Interval Training) exercises to speed up your muscle toning, weight loss, or strengthening progress. With a rowing machine, your whole body has to work the entire time. This makes for some pretty hard and exhausting first few workouts especially if you are just beginning your fitness journey. However, you will soon realize that the more you exercise on the machine, the more fluid your movements become. Why? Because rowing is both a great cardiovascular and muscle strengthening exercise, your heart function will improve, metabolism will increase, and your energy levels will shoot up, making it easier for your body to sail through a rowing session. Now that you know about the many benefits of rowing machines, it is important to find out what options are available before deciding to buy one. At the core, all rowing machines are the same in that they engage the body in repetitive rowing motions that work everything from the rotator cuff down to the calves. When it comes to design; however, the machines tend to differ. Some are made of wood, others steel, while a few models even re-create the actual rowing experience to a tee by featuring 2 oar-like structures in place of a handle. Despite all the different designs that are available, rowing machines are categorized into 4 main types based on resistance type. Often handcrafted and made of wood, this rower type brings the outdoor experience of rowing a boat to your home by incorporating a water-filled flywheel in its design. The flywheel consists of paddles suspended inside an enclosed tank of water. When you pull the machine’s cable, the paddles spin through the water creating a drag force that gets denser the harder and faster you pull. Resistance is also adjustable by removing or adding water to the tank. Water rowing machines have a few downfalls, not the least of which is the fact that they are not that impressive when it comes to aesthetics. These models also make a bit of noise when in use, tend to be large, and can be quite very heavy owing to the water tank. However, water-based rowers have a huge plus over other machines in the sense that they offer the closest simulation of rowing in actual water. You will even hear a swishing sound from the water tank when using the machine. This design earns water rowers the bragging rights of providing the most authentic rowing experience out of all other types of rowers. As such competitive rowers often go for water rowing machines as their preferred pick for training when the weather is not so great outdoors. Unfortunately, the high-end performance of water rowers also means a higher price tag compared to the other types. Comprising of a spin flywheel with fan blades attached to it, air rowers generate wind resistance when you pull on the machine’s handlebars. On one hand, the fan blades get quite noisy while on the other, the wind created simulates outdoor rowing quite well by providing smooth rowing strokes. Air rowing machines are usually not as smooth as their water-based counterparts but it is much smoother than the other 2 types in this list. Much like water rowers, air rowing machine resistance increases the harder you pull. This gives you complete control over how intense your workout will be. 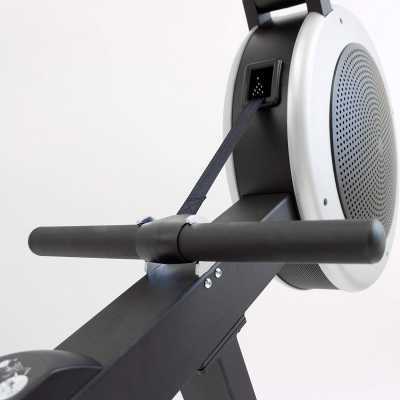 What’s more, some flywheel rowers feature a lever that adjusts resistance by modifying airflow to the fan blade. A display for showing speed, number of strokes taken, time elapsed, calories burned, among other workout stats is also quite common on air rowers. Another upside is that flywheel rowers feature a long seat rail that accommodates both short and tall people. Best known for their super silent operation, magnetic rowers use the combination of electromagnets and a metallic spin flywheel to create braking resistance. During use, a magnet is moved closer to or further away from the flywheel via controls on the machine to increase and decrease resistance. This type of resistance is poor at mimicking outdoor rowing but delivers smooth rowing motions all the same. Aside from a fully adjustable resistance, magnetic rowers can have a digital display for workout data and usually feature a long central rail (much like air rowers). The only problem is that magnetic ergometers do not feature a collapsible or foldable build and can, therefore, be a nuisance for people with small houses. These get their resistance from hydraulic pistons whereby pulling the machine’s handle causes the pistons to pull against the fluid (or sometimes air) in their cylinders. Normally the pistons are 2 in number with each attached to either arm of the machine’s separate handlebars. However, a few hydraulic rowers only feature one piston situated at the centre. The best highlight of piston rowers is that resistance is completely adjustable and usually configured via a knob with a good range of adjust-ability. For instance, you can find a hydraulic rowing machine with 5 or even 8 different levels of resistance. Other advantages include quiet operation and a compact build that can fit into tight spaces. It is also common for hydraulic rowers to have frames that fold away for easy storage. Another upside is that piston-resistance rowers are the cheapest option in the bunch. This; however, comes at a cost given that hydraulic rowing machines are not as effective as other the types. With the focus being more on upper body workout, hydraulic rowers are the only model to offer independent workouts for each arm. But, to make this possible, the handlebars and seat of piston-resistance rowers are fixed, making for a very short range of motion. For this reason, the machines do not replicate actual rowing at all. Rowing machines may be low-impact exercise equipment but getting an uncomfortable machine can lead to issues like back pain or injury, making it difficult to stick to your workouts. So, it’s prudent to ensure the rowing machine you choose offers adequate comfort. Things like spacious cushioned seats, handlebars with some padding or soft material along the grip areas, and adjustable foot pads with straps (or other fasteners) for holding your feet securely in place, are all a good sign of comfort. Next to comfort, adjustability is the most important feature to have in a rowing machine. Usually offered in the form of a lengthy seat rail, variable resistance, or footrests that can be adjusted to fit your feet, a good range of adjustability means that you and anyone else who wishes to exercise on the machine can adjust to a comfortable fit and posture as well as work out at their own pace. Adjustable resistance also makes it possible to switch seamlessly between aerobic and anaerobic workouts as well as increase the challenge to your body as you progress from one fitness level to the next. As a result, you can make every workout session count. Indoor rowers are generally easy to use. That said; however, go for a rower that delivers the most hassle-free user experience. Ideally, assembling the machine should be a walk-in-the-park and not a total nightmare, while adjusting the machine to your liking and working its controls should be a breeze. Since rowing machines create resistance from weighted flywheels, a heavy flywheel will put a higher demand for energy on your body. And the harder you work, the better your fitness results will be. So, the heavier the flywheel, the more effective a rowing machine will be. In general, 30 to 40-pound flywheels are deemed considerably heavy. The best rowers come with a handy display for showing workout information. It will be even better if the rower offers a way of collecting or recording the displayed data to help you keep tabs of your fitness progress. Tracking your fitness gives you a wealth of information on how your body is responding to workouts. You can then use that information to make wise changes that enable you to hit your fitness goals much quicker. As with any purchase, you are going to want good value for money. 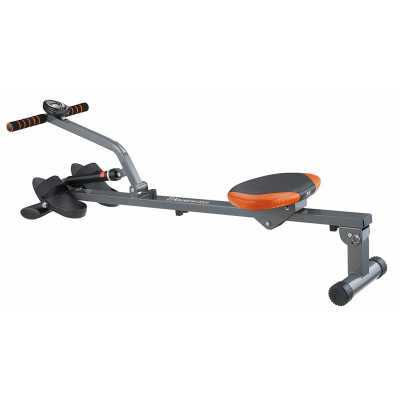 This means a workout machine that is built well with quality materials. The machine should also come with a decent warranty. While there are other things like rowing machine size, how much weight it can support, ease of storage, and noise level, that will come into play when determining a rower’s suitability for you, the above-mentioned features are arguably the most important to have. As long as your rower offers them, you will be able to enjoy the overall relaxing, heart strengthening, fat burning, and muscle sculpting motions of rowing machines to the fullest. As with any major exercise equipment, prices vary widely with rowing machines. But, unlike other exercise equipment, one thing to love about rowing machines is that they have the added advantage of featuring a ton of affordable models in their varied price range. Options begin as low as under £100 and extend all the way to £1000 plus for the high-end models. Expensive rowers tend to have the most advanced features and greater versatility but you can find many mid-range units that strike a good balance between price and performance. It may not be your first pick, but a rowing machine is undoubtedly a fantastic exercise tool – if not one of the best. Thanks to its versatility, the erg can help you lose weight, tone muscles, build strength & muscles, not to mention boost your overall stamina. And, these numerous benefits may be attained without putting too much pressure on injury-prone areas like the neck, back, knees, and ankles. Simply put, rowing machines are definitely worth considering if you are thinking of buying a piece of gym equipment for the home.